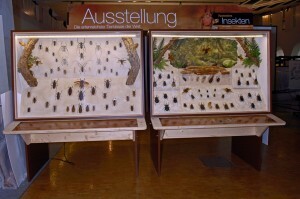 I was always wondering why insect exhibitions in museums were always just dried and pinned insects in boxes. Well, for an enthusiast like me, this was a fantastic thing, as I could see a maximum number of specimen in small space. I did however observe that my family and other people were just glancing through, saying something like ‘Ah well, a lot of insects…’. To me, each insect is fascinating, and I love the details, especially in subspecies. I figured that to interest the broad public and make them aware that insects are not merely something creepy and boring, a different approach is needed. Someone needed to tell the fascinating stories and give insights into their life. Most museums seem to have understood this and reduced their insect exhibitions, but personally I feel that more could be done. Well and then I met Werner Bohren, a guy who created a fantastic exhibition about insects. He chose to show them in a habitat setup, whenever possible to show their larval stages (which are preserved in an awesome way. The larvae of, for instance Dynastes hercules, look almost like alive). His boxes are massive, about 1.5 meters in length, and 40 cm depths, giving ample space to present butterflies, beetles, mantises and many more. He has about 18 boxes (calling them trunks would make more sense), making for a big room filling presentation. Werner’s approach is refreshingly different; he tells all those interesting stories about insects that, we as hobbyists might now, but that make other people interested to know more. Take for example Phasmidae. Did you know that the name derived from the Greek word ‘phasma’ which means ghost? That the longest recent insect in the world is Phobaeticus chani, with 36cm body length? 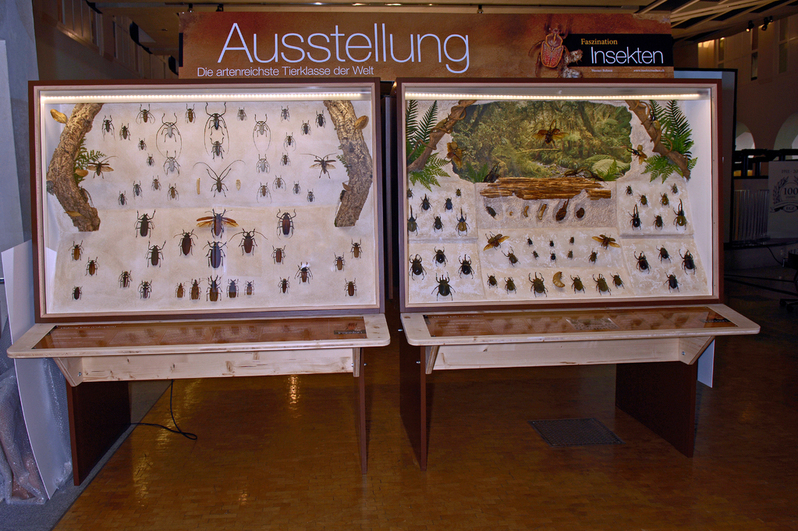 Well, check out the exhibition ‘Faszination Insekten’; for the time being it is only in German, but just looking at the boxes is already fulfilling (ask me, I have only had a sneak preview at the boxes). Oh and for those of you in Switzerland and Germany, the exhibition can be visited from the 9th of July until the 18th of August 2012 in Davos, Switzerland. Here is the link to the flyer with more information. Oh, and for more information about the exhibition and other related stuff check out his web-page.